The church of St Mary, one of Norfolk’s round tower churches, was originally an early medieval cruciform church, with aisles and transepts, but has since altered to its present form of west tower, nave and chancel. The chancel contains some outstanding curvilinear tracery windows. 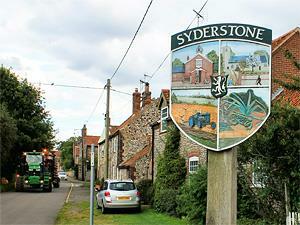 In the 16th century Syderstone Hall was the home of Sir John Robsart, Sheriff of Norfolk and Suffolk, and his daughter, Amy, whose initials are still to be seen in the churchyard gate and over the entrance to the Norman church tower. The present village hall is named after her. In 1549 Amy Robsart married Robert Dudley, Earl of Leicester, and her mysterious death in 1560 led to suspicion that she had been murdered so that Robert might marry Elizabeth I - a suspicion which became the subject of Sir Walter Scott's novel “Kenilworth”. The present Earl of Leicester lives at nearby Holkham Hall. The Village public house is called the Lynn Arms. Syderstone is also known for its large common, which spans roughly 4 square miles and is rich in wildlife.